This is a really nice version of the Turnip Family tale. All of the pieces are hand carved and hand painted. The outer doll is 6 1/2 inches tall and in like new condition with no paint loss and features a farm scene with a large turnip. 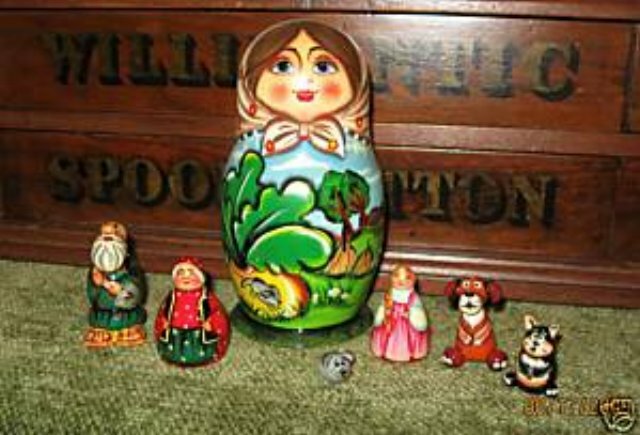 Inside are individual carved figures from the tale who try to pull the turnip from the ground – the Grandfather, Grandmother, Girl, dog, cat, and finally the mouse who tries first.